Mama the horse was used as a test subject for an endoscopy camera pill. 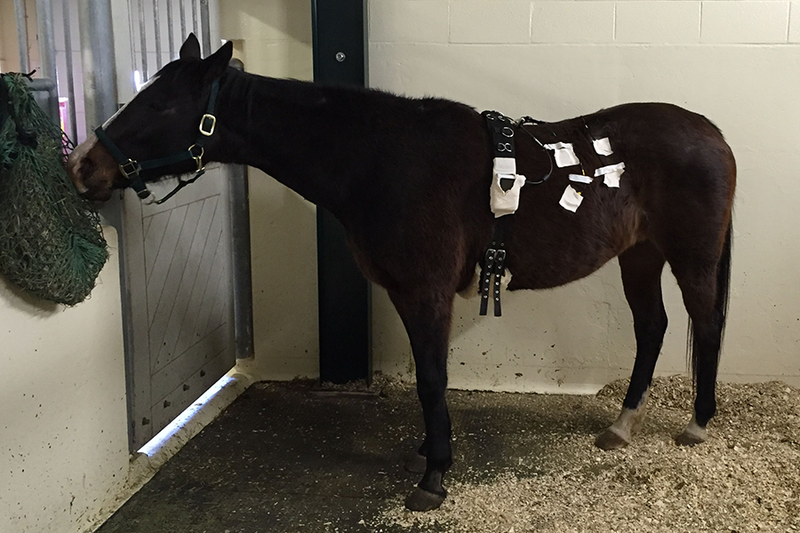 Veterinary and engineering researchers at the University of Saskatchewan have teamed up to harness imaging technology to fill in a blank area in animal health—what goes on in a horse’s gut? "Whenever I talk to students about the horse abdomen, I put up a picture of a horse and put a big question mark in the middle," said veterinary researcher Dr. Julia Montgomery in the Western College of Veterinary Medicine. To help answer the question mark, Montgomery worked with equine surgeon Dr. Joe Bracamonte and U of S electrical and computer engineer Khan Wahid, a specialist in health informatics and imaging. The team used an endoscopy capsule—a sort of "mini submarine" with a camera about the size and shape of a vitamin pill—to have a look inside a horse. Veterinary undergrad student Louisa Belgrave and engineering grad student Shahed Khan Mohammed rounded out the team. "This is really a cool way to look at the entire small intestine," Montgomery said, explaining the only other ways are exploratory surgery or laparoscopy, which uses a thin, lighted tube inserted through an incision in the animal. Neither allows a view from the inside of the gut. Veterinarians also can use an endoscope—basically a camera on the end of a thin cable—to look as far as the horse's stomach, and a rectal exam to have a look from the other end, Montgomery said. Ultrasound can be used, but it can not see through gas. This is a significant drawback since the horse's hindgut, or colon, contains a lot of gas as its food ferments. Montgomery is excited about the possibilities. Capsule endoscopy promises veterinarians a powerful new tool to diagnose diseases such as inflammatory bowel disease and cancer. Veterinary surgeons could use it to check surgical sites to ensure they are healing properly. "This would be the only way to really get a picture from the inside," she said. Researchers could also use it to see how well drugs used to stimulate bowel action are working, or to answer basic questions such as determining what "normal" small intestine function looks like. Wahid, associate professor in the College of Engineering, has long worked with endoscopy capsule technology for humans and has even patented algorithms and data compression technology for their improved performance. The "camera pills" have been in use for human medicine for some time, he explained, but have yet to be applied in equine health. A literature search turned up only one paper on the subject. "We thought, ‘why not try it for veterinary medicine?'" Wahid said. "Because there's nothing like it on the market." On March 1, they did just that. Montgomery, Bracamonte and Wahid used off-the-shelf capsule endoscopy technology. They shaved eight patches on the horse's abdomen to accommodate the sensors and rigged a harness to hold the data recorder for the test run. Then Bracamonte and Montgomery administered the capsule through a stomach tube directly to the horse's stomach. For the next eight hours or so, the capsule and its camera made its way through the horse's small intestine, offering a continuous picture of what was going on inside. Once they started seeing hay, they knew they had reached the horse's cecum, at the entrance to the large intestine. For Wahid, the test was proof-of-concept that capsule endoscopy is effective in horses, and also pointed to some needed improvements. For one, the "movie" has a gap or two as the sensors on the outside of the horse lost the signal from the capsule. "The equipment is designed for a human, and a horse is obviously much larger," he said. He suggests improvements to the sensor array to solve this problem and also give a better idea of the exact location of the capsule within the animal at any point in time. A horse's greater size may also offer opportunity, such as increasing the size of the capsule and with it, the amount of on-board equipment. For example, standard endoscopy capsules have one camera, which has its limitations. "At one point, the capsule got flipped and it was facing backward; we were getting a receding view rather than looking ahead," Wahid said. "So an obvious improvement would be a two-camera capsule." Now that Wahid, Montgomery and Bracamonte have their proof of concept, they plan to run more tests in the next few months on different horses to gather more data. With this in hand, they plan to pursue funding to further develop equine capsule endoscopy. While the immediate beneficiaries may be Saskatchewan horses mainly used for pleasure riding, the North American and international scene includes animals for show jumping and racing—basically the elite athletes of the equine world, with trainers and veterinarians to match. "From the engineering side, we can now look at good data," Wahid explained. "Once we know more about the requirements, we can make it really customizable, a pill specific to the horse."